The Spanish believe that the arrival of spring brings a change in your blood and it´s not without reason. The sun beams down after a cold winter and the Mediterranean returns back to its former glory filled with long days and unbeatable temperatures. For centuries, Mallorca has proudly been one of the best places to experience an unforgettable spring. Our hotel in the old town of Palma offers a different way to appreciate each and every sunny moment which spring offers us but from an exclusive angle: our terraces. Would you like to know more about the outdoor spaces at our establishment? Brondo Architect Hotel will be giving you all the details in this blog article. The clients who have had the privilege of staying with us always mention one particular feature: our large sun terrace at Ca´n Brondo, our restaurant in Palma de Mallorca. We have an open sun terrace in the heart of Palma which offers an immersive experience in a historical building in the city from which you can savour the best international cuisine, snacks, desserts, wine and cocktails on the ample terrace of our emblematic building. Spring is without a doubt one of the best times of year, the temperatures are a little cooler than in summer and the feeling of comfort is unbeatable. Amongst the selection of rooms which we offer at our hotel in the old town of Palma de Mallorca, we find one common factor amongst them which we categorise as our Premium Level. Our Premium rooms and Suites have a private terrace which are strategically facing the city and at the same time incorporate a Balinese bed to maximise the comfort experience. Great weather and relaxation come together in this perfect combination. Who hasn’t dreamed of being on their own private terrace in paradise? When you stay with us you don´t have to dream about it, because we have it. Take a look at our availability options and discover what luxury feels like. During this time of year we are more likely to increase our wellbeing and exercise routines. Summer is just around the corner and feeling comfortable in yourself is fundamental. At Brondo Architect Hotel we can guarantee that we have a unique gym concept in Palma de Mallorca. Our Open Gym is located on the rooftop of our hotel in Palma and has the latest gym equipment so that you can get in shape in the open air with views of this incredible Mediterranean city. You don´t have to give up your comfort or exercise! Brondo Architect Hotel is wellbeing, its comfort, its spring and best of all it´s everything that you want it to be. Which is why we want to encourage you to enjoy a stay that’s different and hard to find anywhere else. Be blown away by the best international cuisine on the Ca’n Brondo large exterior terrace, relax on a Balinese bed in your own space or get in shape at our Open Gym. We´ll make sure that everything else runs smoothly. 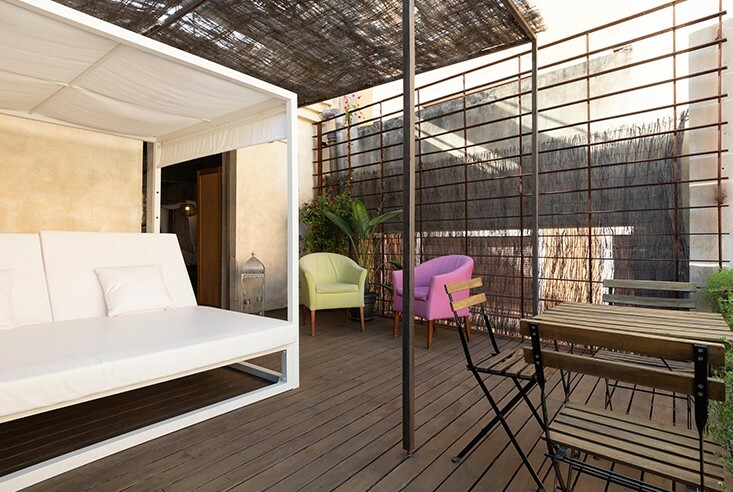 Reserve your room at our hotel in Palma old town and head to the next level. We aren’t in the centre, we are the centre.